Ram Place Fashion Market - Creative video production company based in London. We produce fashion, corporate, commercials, promo films for businesses.Creative video production company based in London. We produce fashion, corporate, commercials, promo films for businesses. 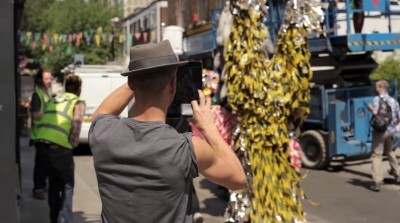 Good Vibe Films is bringing you a short documentary about the exciting 'Ram Place fashion market' 12 - 20 July 2014, which was hosted by Barbican. For nine days Barbican were throwing a pop-up street market in the centre of Hackney where designers, artist, traders and performers joined forces to celebrate London’s youth fashion. 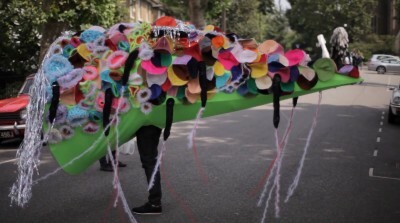 This vibrant and unique event not only included retail stalls from leading east London designers but also included performers, gigs, food and workshops. This full of life event took inspiration from Jean Paul Gaultier's exhibitions, which are famous for illustrating the influence that youth culture has on fashion. This project aimed to enhance the existence of youth fashion in London and to reinforce its exciting and eccentric nature. Too capture this event we filmed a short 5 minute documentary using the Red Scarlet 4k camera and also the Canon 5d camera. The production spread over two days including the walk from Barbican to London Fields and then from London fields to our final destination, which was the fashion market in Ram Place. We also interviewed a range of designers and totem artists such as Lyall Hakaraia, Laura Sheperd, Craig Lawrence and also a very well known hat designer Sahar Freemantle. The totems were designed to represent the diversity and the electricity that London beholds. They created this look by using extraordinary fabrics and materials such as drinking straws, recycled rubbish bins and plastics that are found in the urban environment of London. We had a lot of fun while filming this project and are more than proud to have been part of this fashion event. I hope you enjoy watching our short documentary as much as we enjoyed filming it.